The groups listed are all inclusive and meant for writers at every stage in their career. If you have any questions, please feel free to call the contact person listed. Come join our community of talent! Williamsburg Writers Critique Group - 2nd and 4th Thursdays 1 p.m. The group meets at the home of Elizabeth Brown. Members email their work to all members around three or four days in advance to give others time to review it. The average length is six to ten pages. The other members review and critique the work and come prepared to give oral feedback to the writer. Some bring a hard copy to support their thoughts and others send emails with their remarks. Each writer has a turn getting feedback and critiquing all the others. The average time we meet is two and a half hours. If you don't have any work to submit that week, that is fine. We all have down times. All remarks are meant to be helpful and to support the writers in their quest to improve their art. If you have any questions or you would like to attend, please contact Elizabeth by email ecomptonlee@yahoo.com or phone 804-654-1117. Saturday Poetry Series - Call to confirm next meeting date. Room 127 of the Stryker Building, 209 N. Boundary Street, at 11:00 a.m. Each of our poets presents 10-12 minutes of their poetry. Just across Boundary St. from the free parking garage. Contact: Ed Lull (757) 258-5582, (757) 258-6167 (cell). Lancaster Courthouse - 1st Thursday. Eat at 11 a.m. Share until 2 p.m.
Eat at noon. Meet 1-3 p.m.
Do you have stories to share? Would you like to write your memories for your children and grandchildren? Does a spectacular sunset move you to poetry? Come, join the Rappatomac Writers Critique group where you will find enthusiastic support and gentle critiques to help you on your way—along with fun and laughter to make your journey a pleasant one. If you like to write or listen, have a song in your heart or a poem in your soul, join us once or twice a month, at either or both locations. Community Library. With the right critique group you can learn exponentially, shaving years off the learning curve. Not only do you get some quick and honest feedback on what you’ve written, but the act of critiquing someone else’s manuscript can teach you a great deal about what works and what doesn’t. Contact David Cariens at DCariens@gmail.com or 804 435 7065. Open Mic at the Mathews Memorial Library - 2nd Sunday 1-3 p.m.
Do you enjoy books on tape? Or, love a great short story or an inspiring or humorous poem? If so, come to Open Mic at the Library and hear local writers read their original work. Coffee, tea and light refreshments will be served. The events are free and open to the public. 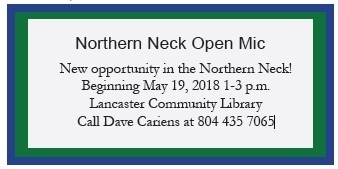 The Library invites all writers in the area to participate in the Open Mic. Arrive on time to sign up to be included on the program. Readers will be limited to one of the following: prose up to 2,500 words; five poems of no more than 50 lines each, or five haiku. No book chapters please, unless they stand alone as independent stories. Mark your calendars and plan to enjoy the works written by the many talented writers living in this community. (804) 725-5747. Open Mic Poetry, Newport News - 2nd Tuesday, 7-9 p.m.
Everyone is welcome to join us at the best coffee house in Newport News, Aroma Coffeehouse and Bakery at 706 Town Center Drive, Suite 104, Newport News.